Reel Classic 5 Slot Guide & Review - Casino Answers! 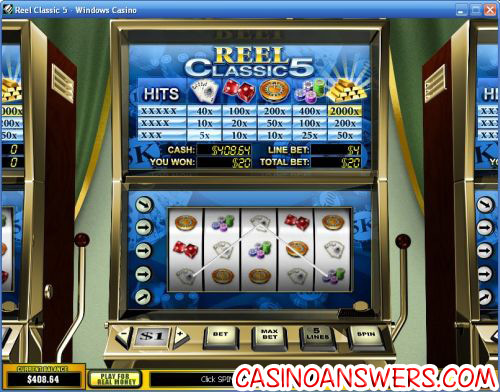 Reel Classic 5 is a 5-reel, 5-line classic slot machine developed by the Playtech online casino software provider. You can play the Reel Classic 5 multi-line reel slot machine at Omni Casino and Europa Casino. The Reel Classic 5 slot machine has a similar design to its cousin, Reel Classic 3. Like it, the top jackpot symbol is the Gold Bars. The other symbols in the slot machine are casino-related, including casino chips, a roulette wheel, a pair of dice and playing cards. Rather than the red colour scheme employed by Reel Classic 3, Reel Classic 5 is blue. Coin sizes available on the Reel Classic 5 slot machine start at $0.01 and can be raised to $0.05, $0.10, $0.25, $0.50, $1, $2 and $5. Choose the number of lines you wish to activate on Reel Classic 5 using the arrow buttons on the left side of the reels or hit “5 Lines” to play all 5 paylines. Press the “Bet” button to wager 1-4 coins per line. The lowest total bet you can make on Reel Classic 5 is a penny per spin all the way up to the highest total bet of $100 per spin. You have the choice of hitting the “Max Bet” or “Spin” buttons to play Reel Classic 5 or you can pull the lever, which works the same as the “Spin” button. To win the 2000X top jackpot on the Reel Classic 5 slot game, you must hit 5 Gold Bars symbols on an active payline. The next highest paying symbol is the Casino Chips symbol, which pays 400X. You can try your hand at hitting one of these big payouts on the Reel Classic 5 slot machine at Omni Casino! There are 5 winning combinations on the slot machine. Payouts on Reel Classic 5 are as follows: 3 Cards symbols (5X), 4 Cards symbols (10X), 5 Cards symbols (40X), 3 Dice symbols (10X), 4 Dice symbols (20X), 5 Dice symbols (100X), 3 Roulette symbols (10X), 4 Roulette symbols (50X), 5 Roulette symbols (200X), 3 Casino Chips symbols (25X), 4 Casino Chips symbols (100X), 5 Casino Chips symbols (400X), 3 Gold Bars symbols (50X), 4 Gold Bars symbols (200X) and 5 Gold Bars symbols (2000X). You can find Reel Classic 5’s autoplay mode under “Menu.” You have the option of using the basic setting of number of spins or you can use the arrows on the left side to expand the autoplay feature into the Advanced Mode. You can set the stop settings of: Jackpot win, single win more than (up to $99,999), overall Win more than (up to $999,999) and overall loss more than (up to $999,999). You can also set the delay between spins to speed up the autoplay. Autoplay can be cancelled at any time by using the “X” button. Much like Reel Classic 3, Reel Classic 5 is a no-frills slot machine from Playtech. The difference from its 3-Reel version is that you can’t find too many 5-reel, 5-line classic slot machines around, so it stands out a lot more. The design is simple, yet interesting. To play the Reel Classic 5 slot machine, sign up today at Omni Casino! Where can I find a review of the 3-Reel version of this slot machine? If you are interested in trying out Reel Classic 3 as well as Reel Classic 5, you can read our Reel Classic 3 Slot Machine Review or play it at Omni Casino. Can I play a Flash game of Reel Classic 5 for free? If you are just looking to try Reel Classic 5 out, you can play a Flash version at both Omni Flash Casino and Europa Flash Casino. If you can’t get the Flash slot game to work properly, you might want to try installing the latest version of Adobe Flash Player on your computer. Are American players able to play the Reel Classic 5 slot game for real money? Unfortunately, American players cannot play at Playtech casinos for real money and are out of luck when it comes to the Reel Classic 5 slot. For a 5-reel, 5-line slot machine that is available to players based in the United States, we recommend you try some of the 5-reel, 5-line slots at Slotland Casino such as Magic Slots. What 5 reel classic slot machines are there?